When you're visiting Zoo Atlanta or the Atlanta Cyclorama or just taking a stroll through Grant Park, be sure to seek out the parapet—cannon platforms from the American Civil War—or more specifically The Siege of Atlanta. 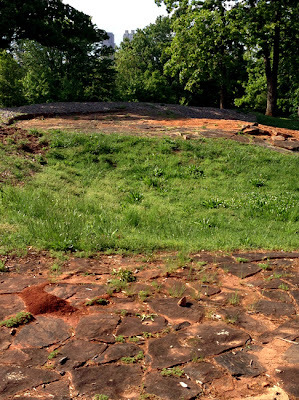 "This line of breastworks is a remnant of the city fortifications occupied by confederate forces during The Siege of Atlanta, July 22 - August 25, 1864. The line, which completely encircled the city, aggregated 12 miles of rifle pits and forts constructions of which was designed and supervised by Capt. Lemuel P. Grant who in 1883 donated the original 100 acres of this area for a city park." There are all kinds of surprising bits of history throughout the city...keep you eyes open.